Blue, an eight-year old Hanovarian mare, suddenly went blind one night. “In the morning, she was found just staring straight ahead and not moving in the middle of the paddock,” explains her owner Kelly Ross. “It was hard to get her to walk inside because she was timid and kept bumping into things. Once we got her safely in the barn, we called her veterinarian who examined her and confirmed she was blind in both eyes.” Blue was treated with steroids and the vision was restored, but she again lost sight in her left eye when she was weaned off the medication. After a two-week stay at an emergency facility where it was suspected she had a tumor, she was brought to the Cornell University Equine Hospital for diagnostic imaging and treatment. “We suspected a compressive mass, but needed imaging to confirm, as well as to help us plan a surgical approach,” explains Dr. Elaine Flory Claffey, clinical instructor in the Section of Large Animal Surgery. On skull computed tomography (CT) scan, a mass was seen in the sphenopalatine sinus as suspected. It appeared to be mostly right-sided and compressing the optic nerve. 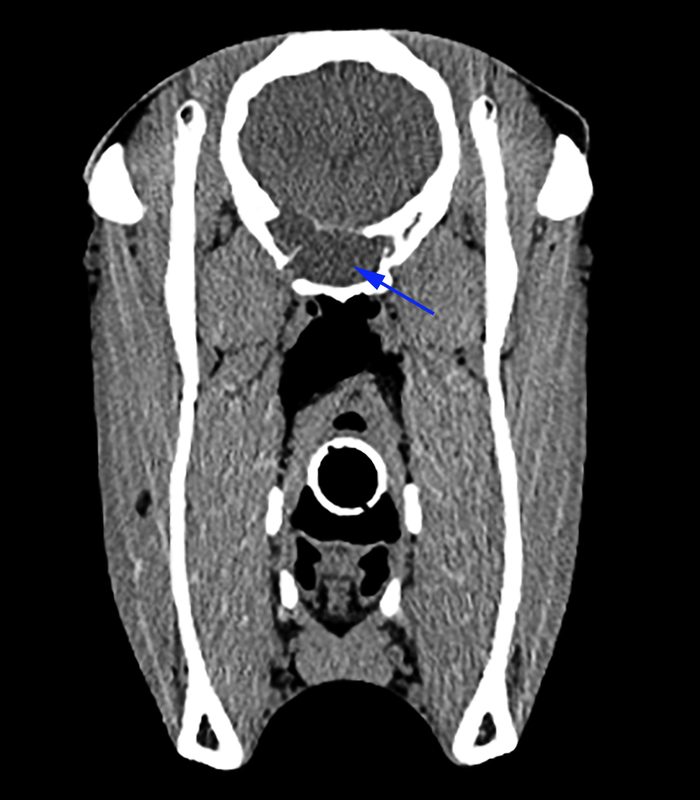 It was thought to most likely be an ethmoid hematoma, neoplasm or sinus cyst. Sinusotomy and surgical removal of the mass were decided on as the best measure to prevent loss of vision in the right eye, but the location of the mass posed some particular challenges. With Dr. Norm Ducharme, the James Law Professor of Surgery, as the lead surgeon, a unique standing surgical procedure was performed during which a sinus flap was opened and an endoscope was passed through the nostrils into the sinuses for visualization. The first time Blue went into surgery, visibility became too difficult to continue with the procedure. After a few days of healing, surgeons went in a second time and found the pathway still accessible and with improved visibility. Due to the methodical and cautious nature of the procedure, it took a few hours to gain surgical access to the sinus. The mass was removed and was suspected to be a sinus cyst. It’s not likely that Blue’s vision will return in the left eye, but it is hoped the removal will decrease the risk of progression of symptoms. Ross says Blue has since returned to her usual self both in personality and in what it’s like to ride her. She even jumped again for the first time shortly after the new year.